"This stock already took a little bit of a breather last month and now it's starting to rally again," Maley said Tuesday on CNBC's "Trading Nation." "The key that's really going on right now is the stock is seeing a golden cross with its 50-day moving average moving above its 200-day moving average." The bullish golden cross forms when a shorter-term moving average crosses above a longer term. It signals the reversal of a downtrend. A golden cross formed March 11 on Netflix's charts. "The last two times in 2015 and 2016, it saw a rally of 120 and 95 percent after they saw the golden crosses," said Maley. "I'm not calling for that kind of a huge rally but history says it's been a positive sign," he said. Maley said the charts have a different story for Apple's stock. "It's getting overbought on a near-term basis," he said Tuesday on "Trading Nation." 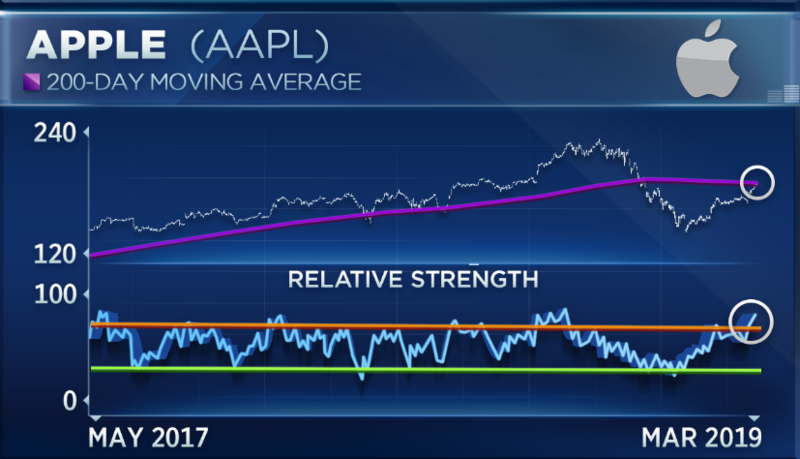 "It's also bumping up against its 200-day moving average so with it being overbought and bumping up against that key moving average I think it's going to have a tough time breaking above it on its first try." "It will probably have to pull back, consolidate its gains, work off that overbought condition before it can rally further," said Maley. "Netflix is obviously the one with the most to lose," Sanchez said Tuesday on "Trading Nation." "My concern is actually that Netflix may actually paint itself into a corner. Everybody is gunning for territory that Netflix has already created. Netflix has a massive spending budget in order to continue to move a needle that quite frankly is getting harder and harder to move in terms of revenue." "You look at the average number of subscriptions that cord cutters have. You're talking about three-plus subscriptions. Quite frankly, viewers are getting subscription fatigue. At some point you're going to have to see some consolidation," Sanchez said.